Any system built on “traditional” SQL databases for both capturing as well as displaying data would be severely strained to keep up with this kind of Big Data demand. 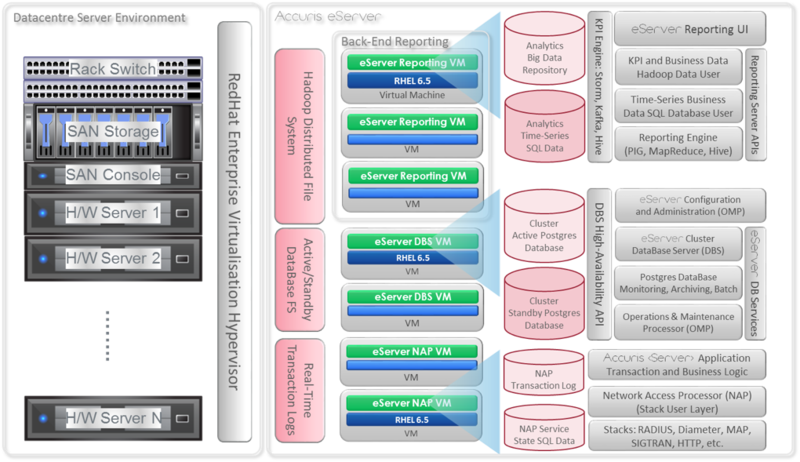 To address this, Accuris Networks re-architected its analytics platform from the ground up. We’ve streamlined the process for exporting data from the different applications and gateway elements, and provide new capabilities for storage in a distributed Hadoop data file structure (HDFS). We have incorporated Hadoop and associated technologies to handle any scale of “Big Data” that our applications generate on behalf of Users and Service-Providers alike. 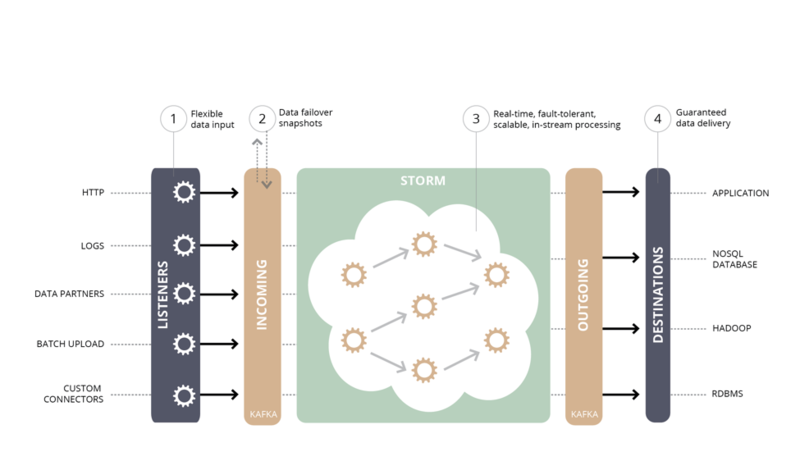 Technologies like Kafka (for streaming large bodies of data as distributable transaction logs towards multiple, redundant Hadoop service-nodes), Storm (for real-time aggregation and pre-analysis of data-streams), Hive (for structuring data in SQL-style data tables for back-end analysis). This is the kind of technology and architecture that drives some of the world’s most demanding web applications (in terms of data generated and real-time analysis required). Services like Netflix, Twitter and Airbnb have tested and hardened this kind of architecture for their Big Data needs. By weaving this architecture into our eServer platform, we have built a foundation capable of handling effectively unlimited amounts of service data that can be analysed in real-time and over extended time-period. Best of all, the platform is available for any deployment model, SaaS, Cloud, virtualized/NFV or traditional in-network servers, which support Accuris’ “pay as you grow” business model. 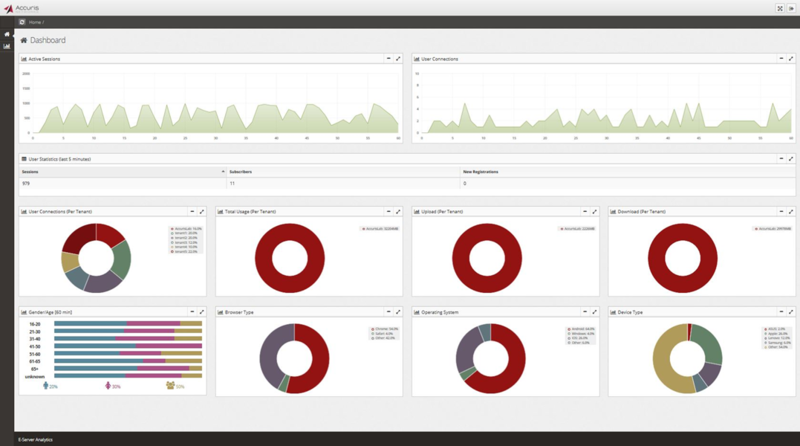 The results of this new analytics architecture are truly impressive. When applied to our eNAC, carrier grade captive portal service, the eAnalytics platform enabled Accuris to handle 4x the number of concurrent sessions (and associated data elements), consuming 50% less CPU and memory. In addition to all that data, Accuris Networks has invested heavily in a flexible, dynamic visual data display engine. The new eAnalytics engine brings data to life in ways that were not possible before, giving your sales/marketing organization the business insights they need to successfully introduce and grow services to your Users. We can also provide your network operations, customer service management, network administration and functions the ability to explore how your subscribers are using the network and services you provide. During the beta testing phase this summer, one customer commented to me that they got transparency into every corner of their Accuris eServer platform with eAnalytics. The eAnalytics engine is a module available to capture and process data from Accuris Networks products such as the eNAC carrier-grade captive portal today, with plans to include the eAAA and eDGW products in their next system release. The new eAnalytics engine is available today as an upgrade to customers with the Accuris Networks platform using the eNAC captive portal system. For more information, contact us directly, or visit the eAnalytics products page, or reach out to your Accuris Networks account manager.